West Point Women: A Natural Pattern Or A Camouflage Ceiling? Since 1980, the percentage of women at the U.S. Military Academy has stayed largely the same, leading some to conclude that the school has set an artificial cap on the number of female cadets it accepts. Now, West Point has been told it must raise those numbers to meet the demand for more female leaders. At the U.S. Military Academy in West Point, N.Y., the graduating class has been about 16 percent female since the institution first accepted women more than 30 years ago. At the 200-year-old U.S. Military Academy at West Point, tradition dictates everything. That includes the habit of having freshmen stand in the yard everyday and call cadets to lunch. It's also tradition that the overwhelming majority of the graduating class will be white and 84 percent male. Some say those rates are due to natural patterns of matriculation. 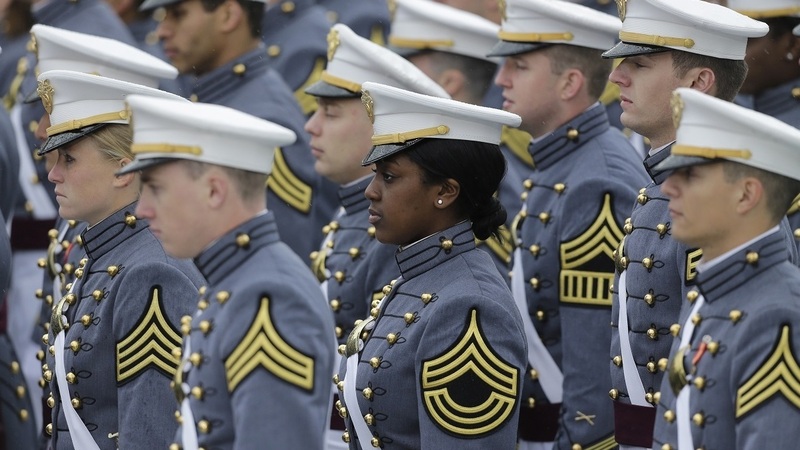 "Women will naturally matriculate — or, they have naturally matriculated — into the academy at about the 16 to 17 percent rate," says West Point admissions director Col. Deborah McDonald. But a new Pentagon policy is requiring the school to change its approach to female cadets. Earlier this year, the military dropped a policy that has kept women out of combat roles. That means that by the time this year's freshman class graduates, women will be eligible to compete for nearly all jobs. As a result, the new superintendent of West Point, Gen. Robert Caslen, says he's been told to enroll a class that is more diverse. "Next year, we're going to recruit a class that will move from 15 to 20 percent," Caslen says. "We don't know yet what the right number is. It could be 25 percent. Heck, it could be 50 percent." But boosting numbers of women beyond the so-called "natural" enrollment rate will take an attitude reversal. For nearly two centuries, there were no women at West Point; the first female cadets graduated in 1980. When Col. Ellen Haring walked across the stage in 1984, women made up 10 percent of the class. She was disappointed to see that, in all the years since, the number has risen only to 16 percent. "I spoke to a number of faculty members who said that there's an explicit class composition goal at West Point that actually functions as a ceiling," Haring says. "And that women haven't risen above 16 percent because the academy only wants 16 percent." West Point says the numbers the school uses are a goal, not a cap. Admissions director Col. Deborah McDonald says that, in fact, the academy also has goals for other groups, including athletes and black students. While West Point has struggled to attract more black students, the goals for women, she says, have been easier to reach. "Since I've been with the admissions department, there hasn't been a ceiling on any applicant member that's coming, on any demographic," says McDonald. "And if there's a perception of a ceiling, that's an inappropriate perception." Gender is, of course, a touchy area for the Pentagon. Service-wide, the military is battling the perception that sexual assault is tolerated. Earlier this year at West Point, the rugby team was temporarily disbanded because team members sent emails full of lewd language about female cadets. But if you talk to female cadets, many say they do feel accepted. First-year student Elizabeth Robben says she's treated like an equal here. That's a sharp contrast to what women her age routinely experience elsewhere. "Unfortunately, there's so much derogatory language being talked about," says Robben. "And when I got here, I heard none of it." Many graduates, however, feel that women cannot be equals at West Point until there are many more of them. "I personally believe that West Point should be planning for the leadership of the Army in the future, not for the Army that's on the ground the day that they recruit someone," says Sue Fulton, who was a member of the first class of West Point women in 1980. Fulton now serves on the Board of Visitors, the school's overseer. She says West Point should admit as many qualified women as possible and not just boost numbers by a few points. The Army says it's starting down that path, and that's led some graduates like Col. Ellen Haring to ask: Why aren't admissions at West Point completely gender blind? "Fundamentally, West Point is a federally funded, free education," Haring says. "So, women are being excluded from a taxpayer-funded educational opportunity." The Army says it wants more women in the officer corps. The question is whether more will join an organization where there are still perceived limits on their numbers.